The bikers superstore for your helmets, boots, leather, textiles, gloves and accessories. Advanced Polycarbonate Composite Shell: Lightweight, superior fit and comfort using advanced CAD technology. Aerodynamic shell with large eye port for greater visibility One-touch integrated sunshield deploys quickly and easily ACS advanced channelling ventilation system. Full front to back airflow flushes heat and humidity out. Removable, moisture-wicking interior with advanced anti-bacterial fabric Rapidfire shield replacement system: Simple and secure shield ratchet system provides ultra-quick, tool-less removal and installation for efficient operation. Micro buckle with retention strap; Quick release and adjustable Anti-fog lens prepared shield. We are an Authorised HJC Dealer. Dark visor for Display Purpose only , Helmet will be Supplied with clear visor only. Dark visor available at 30 pounds extra cost. 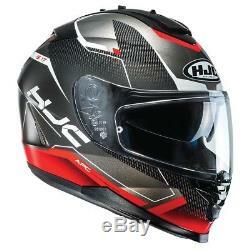 The item "HJC IS-17 Loktar Red IS 17 Full Face Motorcycle Helmet with in built sunvisor" is in sale since Friday, February 9, 2018.